The Maoists want an integrated Nepal army to be loyal to the state, not their own party, insists Prime Minister Prachanda. Why should the generals and political parties not be afraid of integrating the Peoples Liberation Army cadres in the Nepal Army? In your leaked speech of January 2, 2008, you said unit-wise integration is good because “that way our units will remain with us.” Doesn’t this formulation create danger of a state within state? If some units are loyal to one party after integration, this will create a problem, won’t it? First of all, we should not compare the integration process with the January 2008 speech. That was said in very different circumstances. There was uncertainty about whether elections would be held and I needed to boost the morale of my cadres. That cannot be compared to the current situation, after the election and formation of a government Secondly, as far as I understand the process of integration, only those cadres who are physically fit should be integrated in the army. And I think it would be preferable to have unit-wise integration. This is not because we want to remould the whole army according to the Maoist understanding. We want to integrate them. When Maoist cadres are taken [as individuals] into different battalions of the NA, they will take 3-4 years to be really integrated because the PLA cadre are not very professional. They are more political and ideological. And there is necessity of democratising the NA, because it has not been very democratic in its functioning and nature. Now, to do this in a planned way, it’s quite important to have separate units of the PLA coming under the NA’s direct command. Only then can they be really integrated. So you don’t expect the former PLA units will remain loyal to your party after integration in the army? They must be loyal to the state, to the government. We don’t have any confusion on this question. The principle of civilian supremacy over the military cuts both ways. Tomorrow, a non-Maoist government might feel these former PLA units or officers are not loyal and may wish to act against them. Would that be acceptable to you? Yes, this is acceptable to me. According to the constitution, the elected government can take action if they challenge civilian supremacy, if they challenge the decision of the government. Exactly. There is no confusion in my mind. Your critics say the 30-year service rule is being applied to retire senior people in different fields as a way for the Maoists to capture the state. This is wrong. The 30-year provision was there previously in the police. And we established it in the armed police and police. But we do not have the intention to apply it in the army, where the situation is quite different. Although there was a debate and discussion on this, I clearly stated my position, even in public, that in the army, the 30 year issue will not be applicable. The Shaktikhor video has also created doubts about the size of the PLA. There you said, “We were at 7,000 to 8,000. If we had reported that, we would have had 4,000 left after verification. Instead we claimed 35,000 and now we have 20,000.” Don’t you think this admission makes the integration process more difficult? There is a demand for re-verification, for example. That is not going to happen. We had two kinds of regular forces during the Peoples War: central and regional forces. Both were PLA cadres and 35,000 was the combined figure. What I said in the videotape was about the central force, whose number was 7-8,000 at that time. The regional forces were near about 25-27,000. During the peace process, regional and central forces were merged and taken into cantonments. And they were scaled down to 20,000. In fact, during the Peoples War, we also had a militia of irregulars, 65-70,000 strong. We wanted them to be integrated or rehabilitated as well but the government and all major political parties did not agree because the state would not be able to handle such a big force. So it was suggested that this militia should be changed into a political organization. In this way the Young Communist League (YCL) emerged. In your interview to The Hindu in April 2008, you said you wanted to convert the YCL into a development-oriented organisation. But we haven’t heard much about that, and again, there are allegations of criminal activities by the YCL. The YCL has changed from a political to a social and development organisation. There is also a lot of exaggeration about the activities of the YCL; all the positive things they are doing in the development and social sector are not covered by the media. The media only reports things when something bad is done by an individual connected to the YCL. And in those incidents where members are involved, we are taking action against them. Maoist cadres have targeted the media in the past — there was the attack on Himal Khabarpatrika, for example. Can you assure us the party will not tolerate such acts? We are in favour of freedom of the press. But even in democratic countries and old democratic parties there will always be some incidents. In the Himal incident, some of our workers were involved. But I took the initiative and brought them into police custody. India played a positive role in the peace process and the transformation of Nepal to a republic. But now, it appears as if there is distrust between the Maoist leadership and the Indian government. Why? Indian officials say a huge number of Chinese delegation have visited Nepal recently. And they wonder why your defence minister paid a “secret visit” to China. This is also baseless. Last year, because of the Tibet situation, the Chinese side got more sensitive about Tibet-related activities going on in Nepal. I would like to say clearly that not a single delegation came to Nepal on my invitation. The initiative came solely from the Chinese side. As for this “secret visit” of our defence minister, that was no “secret” at all. It was also not much of a “visit.” Some of our ministers went to Tatopani near the border during Deepavali. From there, they crossed the border and went to Khasa and spent the night. Everybody from Kathmandu wants to go to Tatopani and sometimes stay in Khasa to shop. There are also apprehensions on the updated Nepal-China friendship treaty being negotiated. Do you intend to hold wider consultations on this before proceeding? Time and again I have proposed that we should have continuous discussion, so that we can clear any confusion. We have a very specific type of relation with India — an open border, history, culture. When I was in Delhi, I tried to explain why our relations are unique. With China, we have our own specific nature of relations — because of the Himalayan range. One should not confuse this issue. As for the treaty, there is still so much discussion to be held between the parties here. Nothing is going to be signed in a hurry. Certainly, I was not going to sign anything during the trip I had scheduled to Beijing before this crisis. 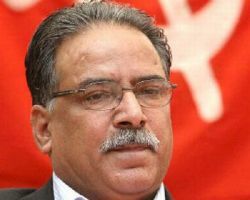 I extend thanks that you have disclosed the reality of Nepalese Maoist leader Prachanda. Nepalese Maoists want to stablish anarchism in Nepal as well as India. Actually, Nepalese Maoist leader Parcanda is a very flexible man. When he visits China, he becomes a great follower of China, when he meets Indian he becomes more Indian and identifies special relations between Nepal and India. In his visit of UN (he met the American –President Bush almost three minute) he became as a supporter of free-Tibet.The Maoist Prachanda is a notorious & incumbent man. The Maoists want to stablish terrorism with criminals attitude.So, you have published his opportunist attitude in time. This entry was posted on May 12, 2009 by Siddharth Varadarajan in Interviews, Nepal.